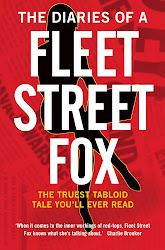 fleet street fox: Top marks. THE problem with school is that all the most useful lessons happen outside the classroom. Things like how to dodge a scrap, and when to turn and fight. How to combine your dinner and bus money to buy a portion of chips while you walk all the way home. You learn how to lose friends and make new ones, and practice a look of total innocence. You still need maths, and a smattering of science, and how to use an apostrophe correctly if people you meet are not to dismiss you as an idiot, but unless you make one of those subjects the centre of your career you can thankfully forget all about algebra and iambic pentameter. Me, I picked apostrophes. I understood apostrophes. That kind of realpolitik is not welcome news to people who think they know best, which is why the education system is constantly being tinkered with. When I was at school it was Baker days, ending dissection because it upset people, and trying to shove everyone at university because that way we'd all be millionaires. After I left it was constant complaints about dumbing down the system, new-fangled subjects and starring A-grades to make them sound better. Now the government has decided to tear up the National Curriculum and retry exams which were scrapped for being unfair 30 years ago. I sat GCSEs in the 1990s, and they were pretty hard as were my A-levels. We got graded not just on the exams but on modules and projects during the course of two years, which made it a slightly fairer judgement on our work. They weren't easy or dumbed-down, and I worked damn hard to do well. Problems crept in because exam boards were allowed to bid for the task of setting exams, meaning that over the years those which were cheapest and promised the highest grades got picked by schools which were ordered to compete by means of exam league tables. The open market in examinations, league tables, and penny pinching was carried out by a succession of government ministers each of whom seems to have felt that in order to succeed pupils should be more like government ministers. So you must get As, and if other people get them too they are 'devalued' and you must have the ones with a special star. You must go to university, you must earn more than £60,000 a year, and you must be the kind of person who writes rules rather than follows them. Never mind that the people who make the world go round are the ones who earn less, who pay their taxes, who follow the rules and grumble about it, or that the very few who change the world are usually those who can't see a rule without breaking it, who hated school and couldn't wait to get out. 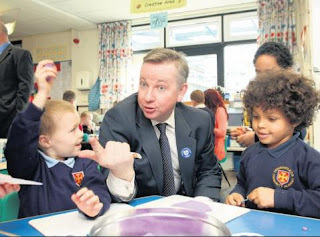 Our current Education Secretary Michael Gove won a scholarship to an independent school and studied English at Oxford. Well done him, but if we were all like that who'd drive the buses? His artfully-leaked exam blueprints - sneakily done, old son, I bet you learned that outside a classroom - show he wants to get rid of the competing exam boards and have a single standard by which children will be judged. At the same time he wants to tell schools what to teach while getting rid of the National Curriculum which is the only real means by which he can enforce the instructions, and to introduce easier CSE exams for "less intelligent" pupils with questions on working out your change in a shop and understanding a rail timetable. And that's where what he learned at school differs from what I did. First if you are going to tell someone what to do you need to make sure they will do it, and secondly there is no such thing as "less intelligent", not really. There are children who are slower, who find it harder, who don't get apostrophes so well or are wired a bit differently. If they find something they enjoy they'll soak it up like a sponge, and the main flaw in our education system is that if lessons don't turn you on you're left to find something that will. Sometimes those children just become disruptive, sometimes they stare out of the window and get low marks, and live ordinary lives, and sometimes they become incredibly good criminals. They're all perfectly capable of applying themselves to things if they can see the point, and our courts are full of people who didn't get a lot of exams and would be amazing if they were running a legitimate business. The single problem which no-one dares tinker with is that if you don't like exams there's nothing else for you. If you become a plumber, a builder, or run your own business it's because someone outside school helped you do it. That's odd, because vocational classes - not just for the "less intelligent" but everyone - could not possibly hurt. Clever A-grade youngsters would know how to change a fan belt and plaster a wall, while the exam-phobic ones might just find they're inspired by computer code, building machines or inventing new and brilliant things. Personally, if someone with a dozen A* grades and a degree under their belt wanted my help to get them a job I'd think twice, because life is about more than sitting exams. But if there were another with a skill of some kind it's far more impressive in the real world. 1. You buy a £331 armchair, a £493 cabinet, a pair of elephant lamps for £134.50, a £750 Loire table, a birch Camargue chair worth £432, a birdcage coffee table for £238.50, a £454 dishwasher, a £639 range cooker, a £702 fridge freezer, a £20 toaster, a £35 children's mattress, and a £30 doormat. How much of it can you claim from the taxpayer? c) something we won't mention? Correct answers: Anything that makes you sound like you ought to be running the country. The 'Gove levels' are just that - a way of turning youngsters into a version of a smug politician who not a soul in the world could warm to, while tinkering endlessly with a broken system without ever actually fixing it. Which is hardly making the grade in anyone's book.